Did You Know Bees Love Blue and Violet? Come to the Master Gardeners Booth at the San Juan County Fair! Did you know that native bees and honey bees love blue and violet flowers? Why? Plants may have evolved blue and violet flowers to be attractive to their most efficient pollinators. A bee’s eye perceives blue, violet, and ultraviolet light best. They have no photoreceptors for red and orange, as hummingbirds do. Blue and violet flowers are often nectar-rich, providing a sugary energy source very important to bees. Be sure to visit the Master Gardeners booth at the San Juan County Fair. 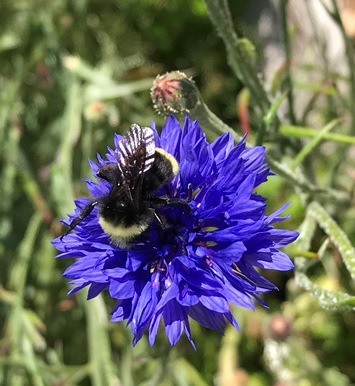 There will be a microscope to see our pollinators up close, a game with prizes, and examples of plants bees love, including borage and pincushion flower (Scabiosa). And be sure to pick up our brochure of plants for pollinators, including natives that will be included in our spring Native Plant Sale.